The previous chapter described an implementation of an electrothermal (thermal-diffusivity-based) frequency reference. A prototype in a standard 0.7μm CMOS technology demonstrated the feasibility of such references. The inaccuracy of its 1.6MHz output frequency was ±0.1% over the military temperature range, and its cycle-to-cycle jitter was about 400ps (rms). 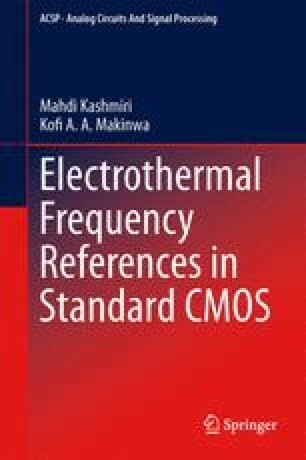 This chapter describes the implementation of a scaled electrothermal frequency reference, whose performance is improved by means of scaling.